Thunder Mountain, Idaho, also known as Thunder Mountain City, was the site of a great mining excitement during the first few years of the first decade of the 1900s. It was also largely a bust fueled by the convergence of several factors: unusual geology for a gold strike that often confused the experts, an extremely remote and difficult to access location, and speculation fueled by people’s need for a new mining excitement during a time when mining in Idaho had been stagnant for a number of years. As far back as 1867, gold bearing outcrops had been discovered on Thunder Mountain in central Idaho. At the time the area was Indian territory, and prospectors were forced out before any serious investigations could be made. It took nearly three decades for prospectors to return to the mountain. 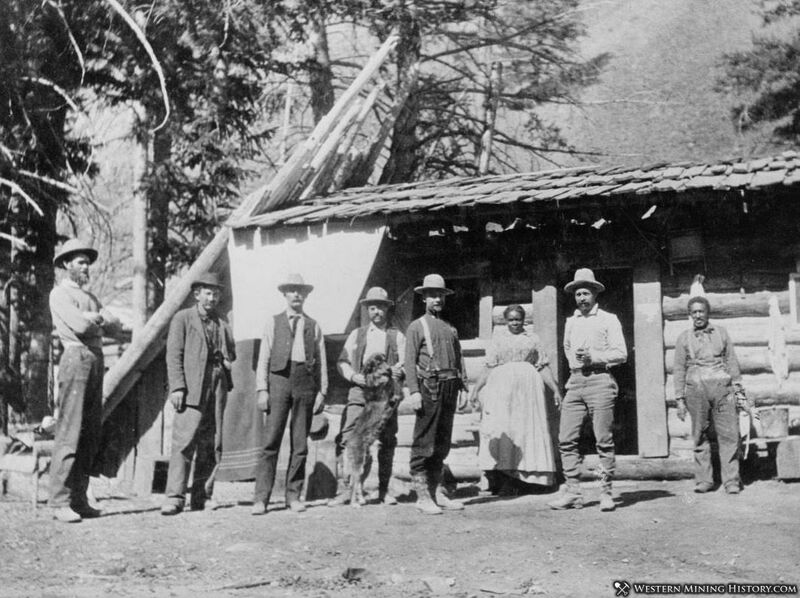 Ben and Lou Caswell, twin brothers from Michigan, prospected in the Thunder Mountain mountain area starting in 1894. Surface indications for gold were positive, so the brothers settled on Cabin Creek for the summer, hunting and trapping to survive. They returned the next two summers and placer mined during the short two-week seasons that the limited availability of water allowed. The brothers recovered $245 in eight days during the summer of 1895, and $190 in 1896. In 1897 they were joined by their brother Dan and another man, and the four miners produced $900 in gold during the short placer season of that year. Each year the brothers would spend months preparing for the brief placer season allowed by water sourced from melting snow, and every year they improved their output. 1898 saw $3,000 in gold production, and $4,000 in 1899. By 1899, enough news had spread about the successful operation that other prospectors began to arrive at the Thunder Mountain diggings. A visiting mining engineer reported in 1899 that the Thunder Mountain deposits were “immensely rich” with “phenomenal surface showings”, and that the district was “destined to be the leading gold camp in Idaho.” The deposits were repeatedly compared to the spectacular discoveries at Cripple Creek, Colorado. By 1900 outside capital was being actively sought to develop the new district. W.H. Dewey, a prominent mine operator out of Silver City, was the first backer to commit to the Thunder Mountain mines. In 1901, Dewey bought the Caswell claims for $100,000, and purchased a stamp mill to be assembled at his newly acquired properties. By fall of 1901, reports like this were numerous and many were being made by professional mining engineers, adding to the excitement. The news was spreading throughout the country and a great rush was expected of both people and capital to the new district. Dewey ordered a second stamp mill before the first was even completed. Another mine in the district was sold, this time for $125,000. News of these events and others fueled hysteria nation wide and it was estimated that over 20,000 people from all over the country were heading out to Thunder Mountain. The peak of the Thunder Mountain hysteria hit just as winter was setting into the mountains of southern Idaho. Thunder Mountain was largely inaccessible during the winter months due to snow blocking the trails. Anyone that planned to spend the winter on the mountain needed to store enough supplies to last the season. Dewey’s operation brought in hundreds of mules loaded with supplies for his mine and men. The thousands of people traveling to Idaho in search of riches were not content spending the winter waiting for the trails to Thunder Mountain to open again. With food shortages on the mountain imminent, warnings were issued to prospective miners to not travel to Thunder Mountain unless they could pack in enough food and supplies for the winter. By January of 1902, miners were piling up at Warren and other towns waiting for trail conditions to improve. Meanwhile, conditions at Thunder Mountain had become critical. 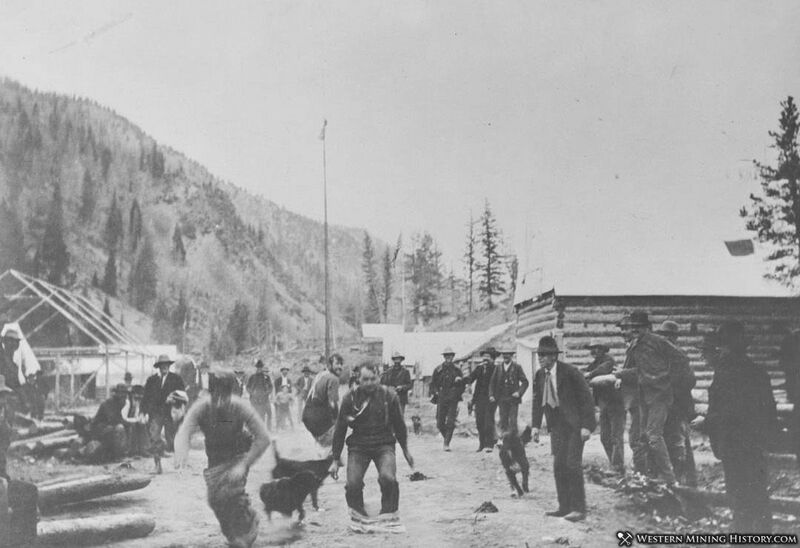 Food was running out and around 75 miners were preparing to leave the camp or face starvation. 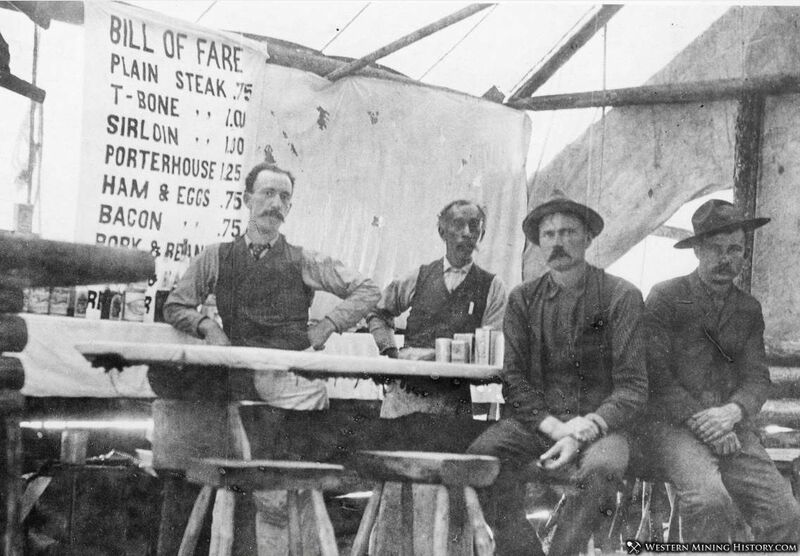 Newly discovered claims were reported to be selling for $5,000 each, but at the time groceries had become more valuable than gold. By early February, desperate attempts to resupply the starving camp were made by sending dog sled teams to Thunder Mountain with tons of supplies. Unfortunately many of the prospective miners that had been waiting for improved trail conditions saw this as a sign that it was time to set out for the mountain so they could stake their claims before the main body of the rush arrived in the spring. Thus the great 1902 rush to Thunder mountain began while winter still held its grip on the region and food and supplies were already at critical levels. Despite difficult winter conditions and occasional snow slides that took at least a few lives, the miners continued to brave the difficult routes to Thunder Mountain. Dog sled teams were suddenly in great demand, both for prospective miners attempting to reach the new district and for freighters attempting to resupply the camp. "Not an ounce of food is to be bought in Thunder Mountain at any price", said Sheriff J. Dixon, who arrived here today [early April] from Warren. "Men are coming out every day as far as Warren for food, where can buy staple groceries in limited quantities. It is an 80-mile trip, the way most of the travel goes now, and takes about four days either way. A man who is not well equipped will eat in the eight days coming and going almost all he can carry." "But the rush continues. One man who came out to Warren last week met four going in without even a cracker. He divided his last three biscuits among them, telling them that they could buy nothing further on. Still they went in. Others are going not much better prepared." "Ten degrees below zero was the record all through the mountains last week. Considerable snow has fallen. There are now between five and six feet of snow at Thunder Mountain, according to all reports." With spring approaching, the grand rush to Thunder Mountain was about to reach its frenzied climax. Hotels in almost every major Idaho city were packed with people on their way to the new district. When the trails were finally cleared for travel, over a thousand pack mules were lined up to begin the ascent of Elk Summit on the trail to Thunder Mountain. Supply problems and food shortages were finally alleviated, to the great relief of those that had endured the hardships of the long winter on the mountain. By June of 1902, it was estimated that over 2,000 miners had entered the district, far less than initially predicted. 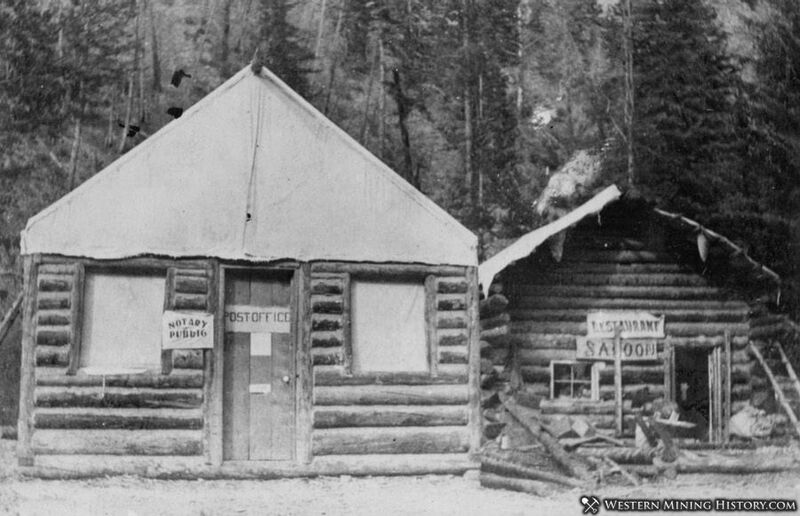 Thunder Mountain City had 10 cabins and forty tents to house the roughly 250 miners that had taken up residence in town. Five major mines employed about 150 men in the district in 1902. Two hundred-stamp mills were purchased for the district and shipped to supply points in Idaho but could not complete the trip to Thunder Mountain that year due to lack of roads. Plans to increase mine production and employ up to 600 miners through the winter were stalled by continued transportation problems and the early onset of winter. What occurred after the 1902 rush was certainly less spectacular than the predictions of early promoters of the district. No great bonanza was discovered and it became clear Thunder Mountain was not going to be the next Cripple Creek. Gold deposits were significant enough to keep some mines operating but supply problems to the remote district continued to slow development. It wasn’t until 1904 that a road even got close to Thunder Mountain, being built to the nearby town of Roosevelt. The two stamp mills that had been shipped to Idaho in 1902 were finally able to be delivered to the mines in 1904 after the completion of the road. However, one of the mills was ordered for Dewey’s operation didn’t even get shipped to the mines as by this time it was determined that the current 10-stamp mill was sufficient to process the ore that was being mined. Ore values continued to decline at the Thunder Mountain mines until all of the large mines were closed by 1908. Dewey’s company, although having several productive years, only recovered half of its total investment. Limited mining occurred after 1909 and the district is only credited with $500,000 in total production, far less than was invested during the great excitement generated at Thunder Mountain. The situation at Thunder Mountain was unique. Gold deposits had rich surface indicators but the unusual geology made initial evaluation difficult. Given the districts extremely remote and difficult location, adequate exploration would have taken years, but nobody wanted to take years and risk losing out on a potential bonanza. Promoters were willing to create overly optimistic reports on the district’s potential, and capital investors were more than happy to sink money into the mines without the proper diligence. Thousands of miners were willing and eager to put their very lives on the line for a chance at riches. The fact that all this happened after 1900, when decades of booms and busts should have served as lessons for everyone involved, is a powerful statement on the irresistible draw of gold and the chance at riches.